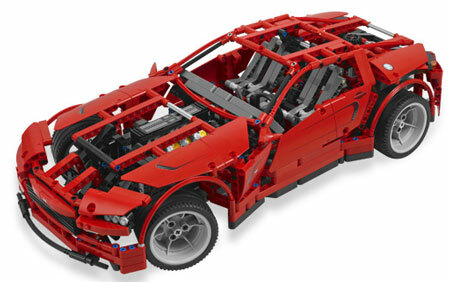 Lego’s Technic Supercar rolls in at 18″ long, 8″ wide, and 1281 pieces deep. It features opening scissor doors, an extendable rear spoiler, a realistic suspension, and popable hood that exposes moving pistons. The Supercar includes a Power Functions motor, although I cannot quite figure out exactly which functions it is used to control. I’m thinking that it opens up all of the doors and compartments at once. The Supercar is priced at $120, so beware of price gougers. As of 4/20/11, you can still order one at its normal price from the Lego store or larger retailers such as ToysRUs. If this model doesn’t quite catch your eye, check out the alternate “B” model! I regretfully passed on buying and building the past few Lego Technic and Technic Ferrari cars, so I wasn’t about to pass this one up! The main configuration has a very nice Viper-like feel about it. The B configuration has a nice Model A feel about it (though arguably with a few more body panels it could look like a Prowler) and could be modified to perfection with a couple of those round finishing tiles for lights and a few more of those shell pieces for fenders. I have the 8880 supercar from when I was a kid. It is still my favorite lego set by far!! 4 wheel drive, 4 wheel steering, 4 wheel independent suspension (4x4x4) also a 4 speed transmission, and some other fun stuff. I will probably re-build it at some point, if only to clean everything up and have the fun of building again. I might get this set, but I think the firehouse would come before this. The 8880 has a great look to it. Most of my childhood Legos were of the playset type, not that I’m complaining! I had a few of the smaller police vehicles, and my sister had a medieval one or two. 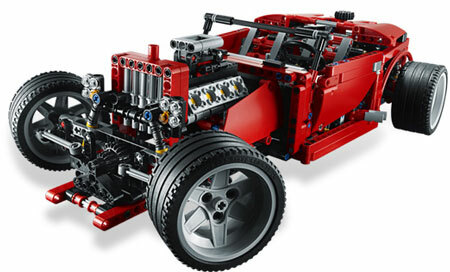 Anyhow, the newer Technic sets are almost out, and from what I’ve seen on the web they look awesome! No new Supercar, but there are a few decent trucks.